Hi guys! The day has finally come... 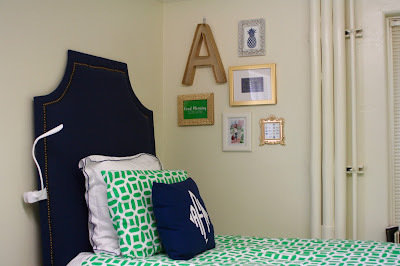 I'm sharing my dorm tour! 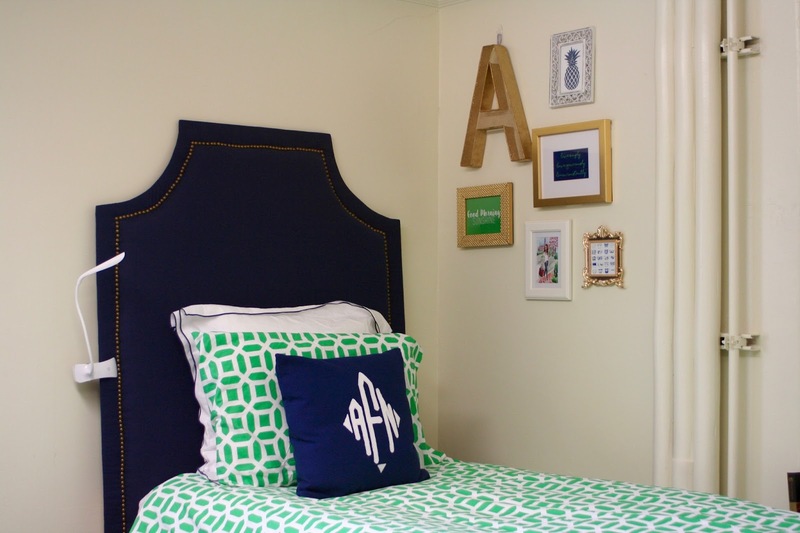 I love how my dorm turned out and am so excited to share it with all of you. Some of you may think this is over the top or crazy but I really wanted to be comfortable in my room. I wanted a room that would make me happy after a long day. I did spend a lot of time DIYing things and shopping to get the best deals on items, and I invested in some things I know I'll use all 4 years. 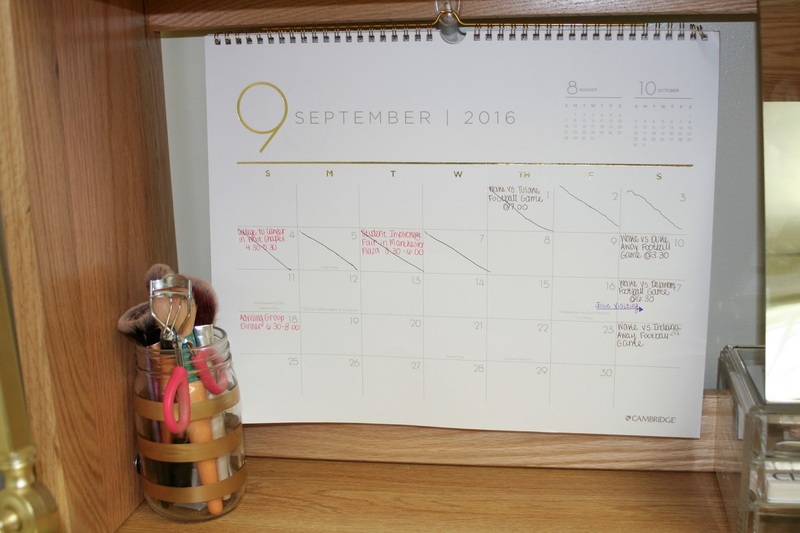 I also wanted to share that I attend Wake Forest University; I am living in one of the 6 freshman dorms. 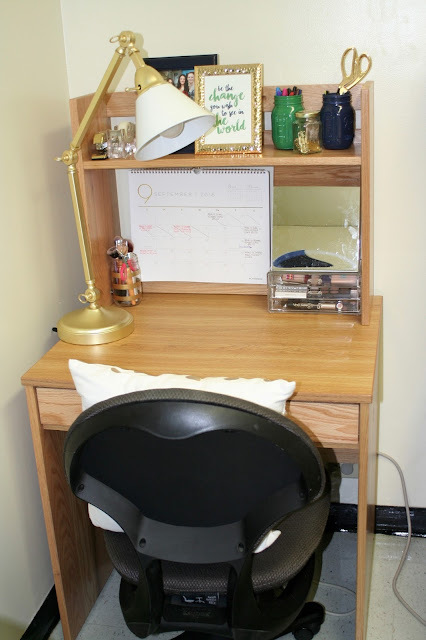 I'm not going to share which dorm I am in to maintain a little bit of privacy, but if any of you are considering attending Wake Forest University please email me(mywelldressedlife@gmail.com) and I would be happy to share what room this is, as well as pictures that show more of the whole room. 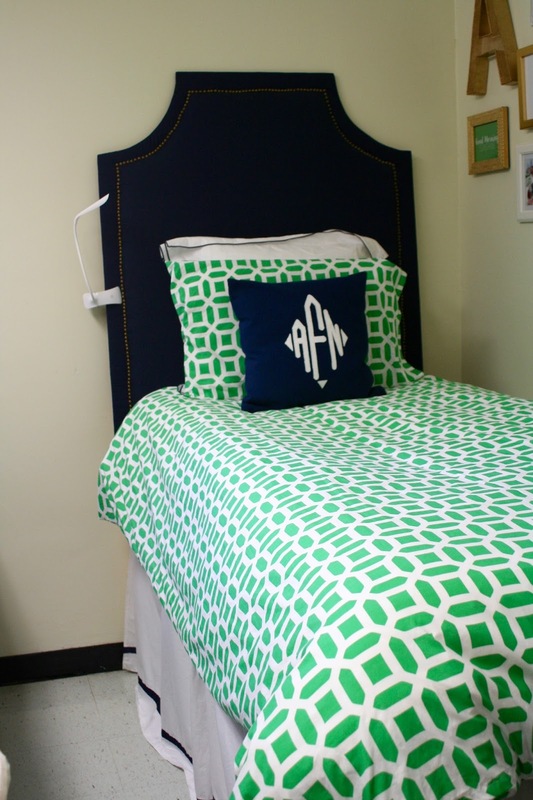 I know I scoured the internet for details about the dorms at Wake Forest while I was planning for my room. 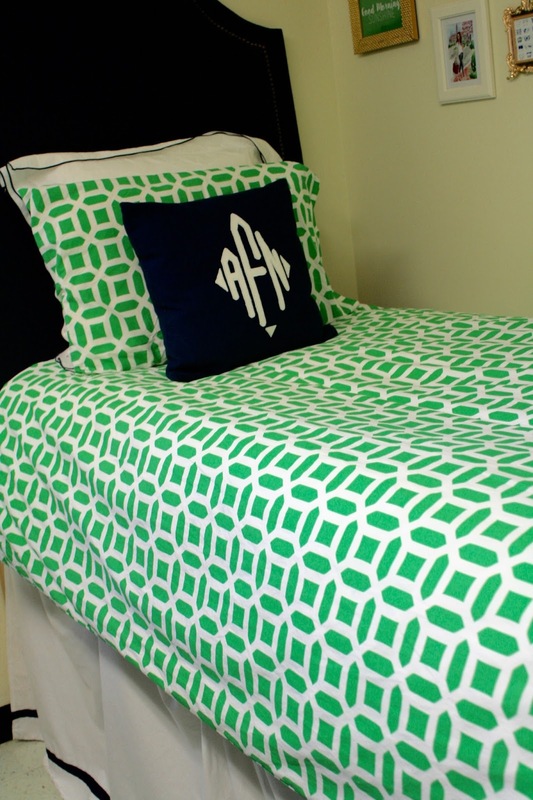 For my bedding I went with this fun green geo patterned duvet from PB Teen. 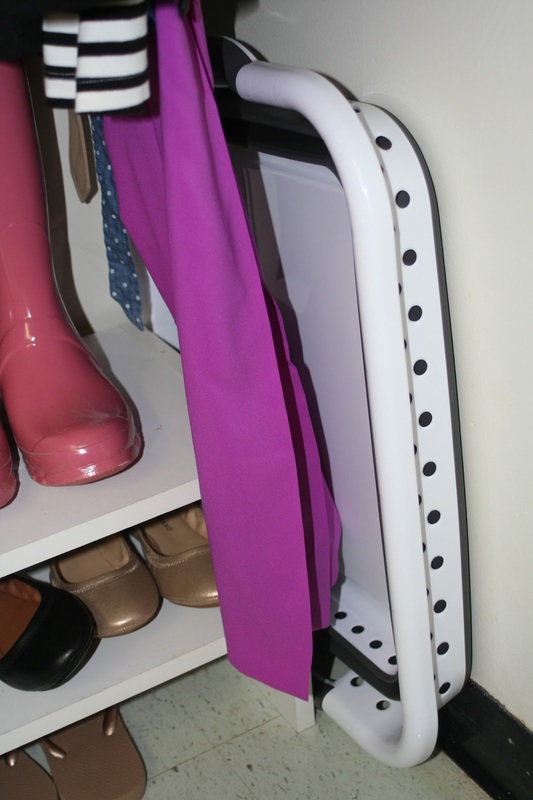 I absolutely love it and think it is so bright and the perfect pop of color. I didn't want to get a sham of the same pattern so I opted for a white one with some navy detailing from PB Teen. I used the matching pillow case to bring the print back in. I found this cute monogram pillow on Etsy and thought it perfectly brought in the navy. 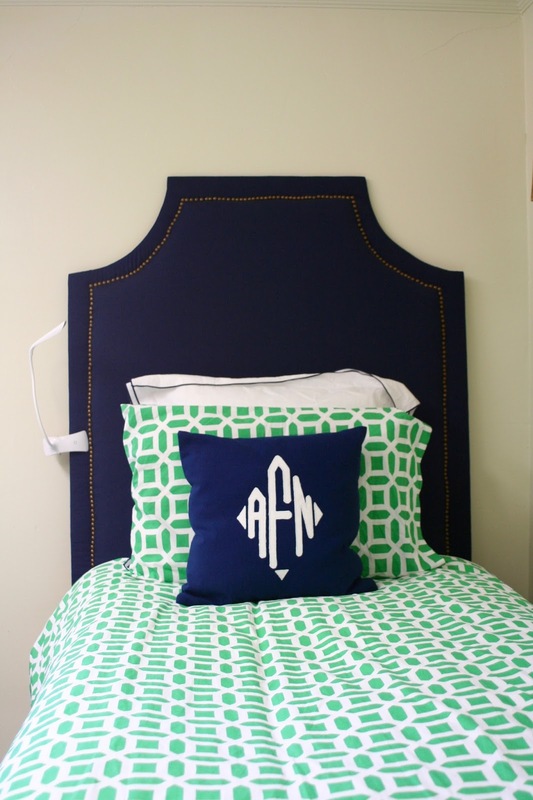 I made my headboard using this tutorial. The light is from Amazon and is perfect for nights when my roommate wants to go to bed and I don't. 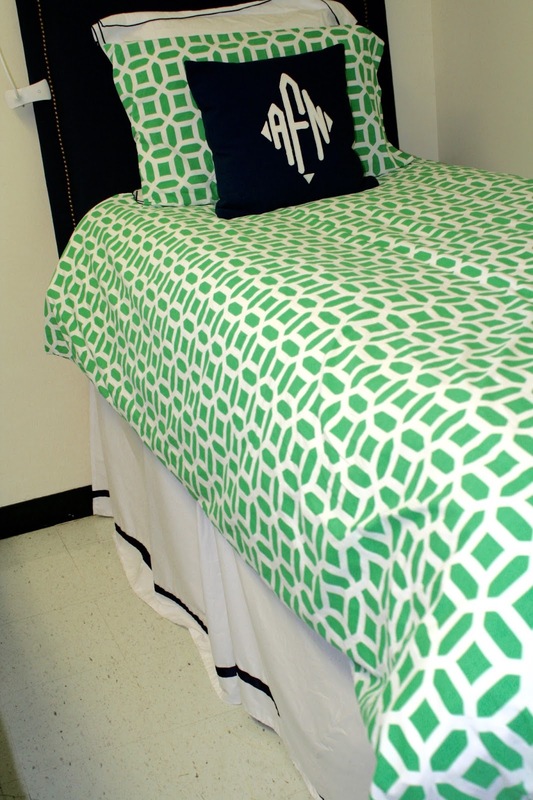 I also made the bed skirt using white fabric and navy ribbon, I used this image from Dorm Decor to make it! I absolutely love my gallery wall! You can see all the details as well as get some details in this post. 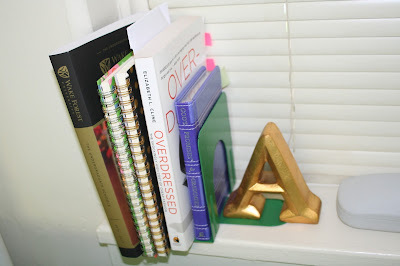 DIY bookend: the bookend is from Amazon and I painted it green and glued this A from Kirkland's on it. I love this cart! 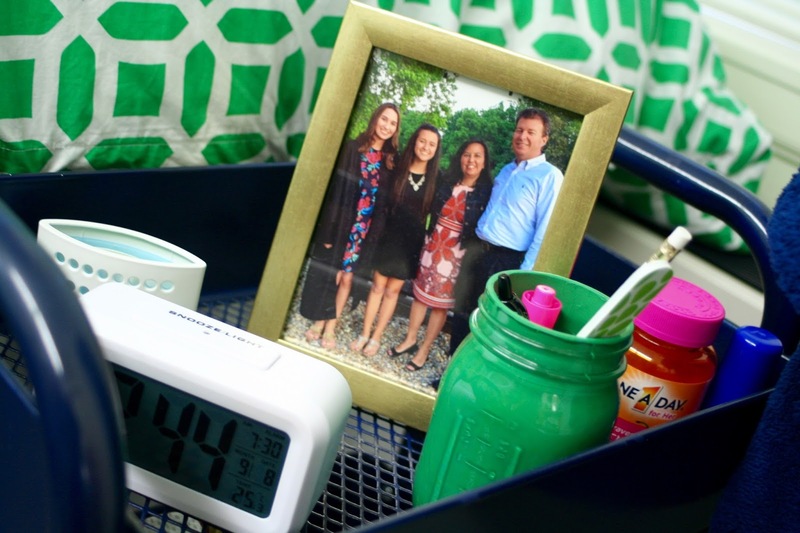 It is the perfect night stand/ storage solution. 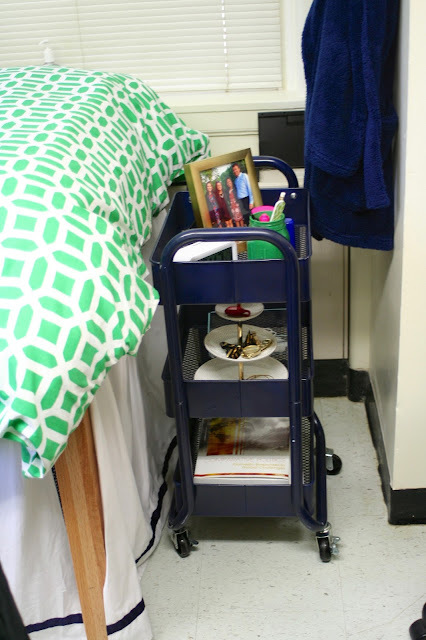 I keep it at the end of my bed and can move it over to the side of my bed if necessary to use as a table. The cart is from Target. As for everything on the cart: Clock-Amazon, Frame- Home Goods, Jewelry Dish- Target. The bottom I use to store books I am not using that day! 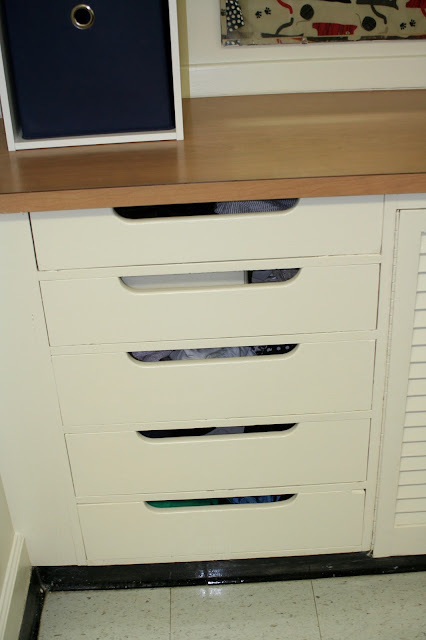 Under my bed, I have four Sterilite bins. There are 2 in the front and 2 in the back. 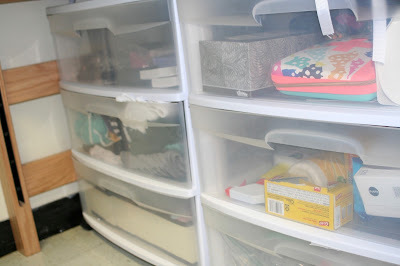 They store toiletries, extra sheets and towels, snacks, clothes, and other essentials. 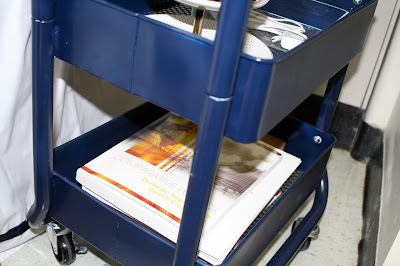 I also have this printer cart that my dad made for me. It stores my printer as well as paper and file folders. Next to my printer cart, I have my laundry basket. 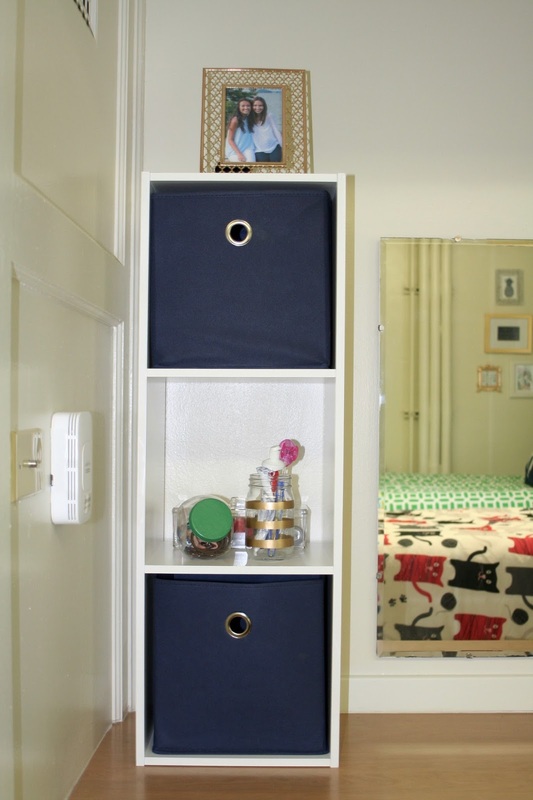 It is from PB Teen and can be used as a hamper as well as be taken down to the laundry room. I really wanted to share this because I know I struggled a lot with what to put under my bed and this worked out great for me! 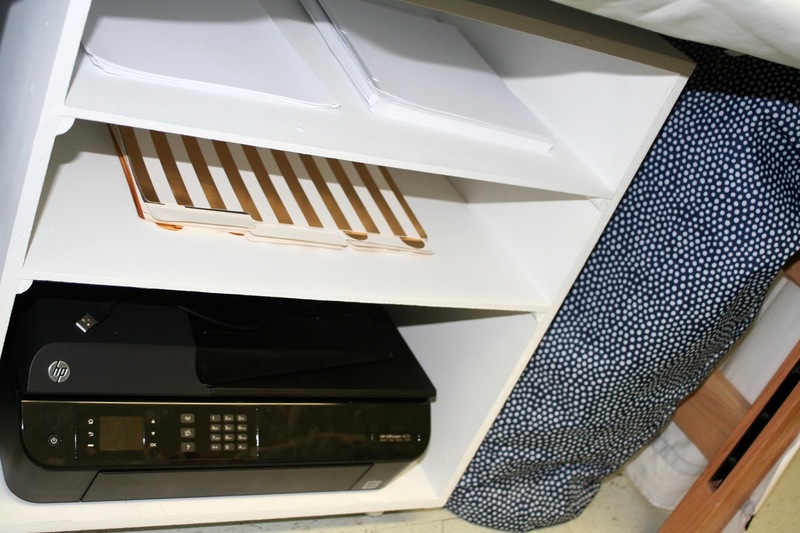 We have this long built in dresser in our dorm which is nice except some of the drawers are really small. On top of the dresser, I put a 3 cube organizer from Target. 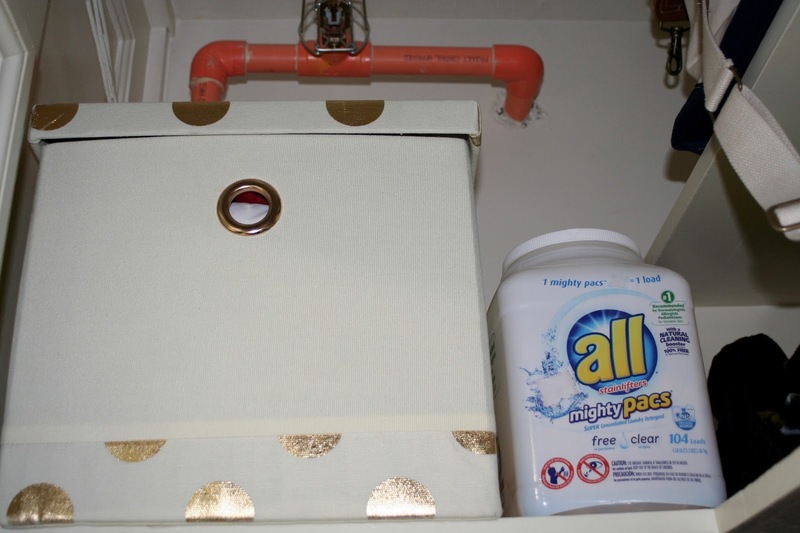 I use this to store my hair products and daily toiletries. It really helps to keep everything put away and looking nice. In the middle one I have my nail polish, a jar with my hair ties, and my toothbrush and toothpaste. It really works perfectly! 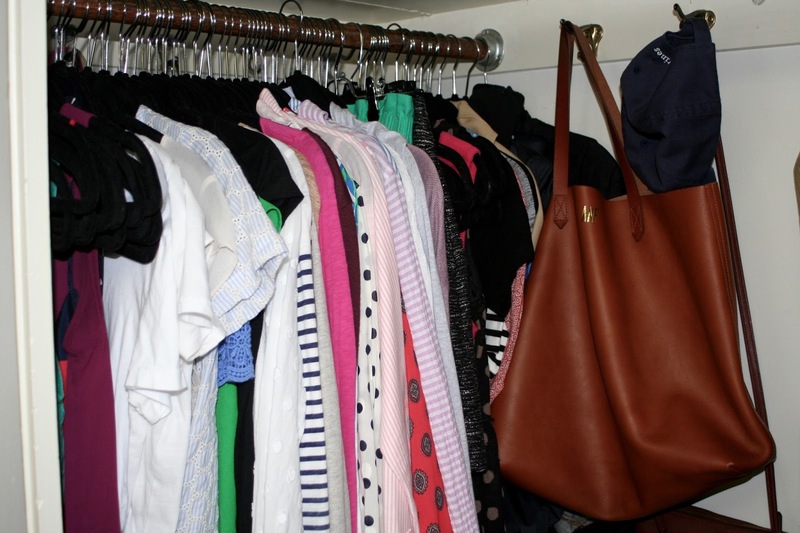 We have a walk in closet that we share, but I have quite a bit of space to keep all of my clothes. 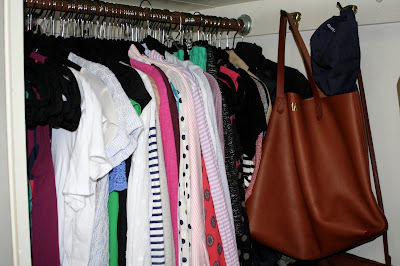 I actually brought a ton of clothes and they all thankfully fit! I have all my shirts, dresses, and skirts hanging on the bar. 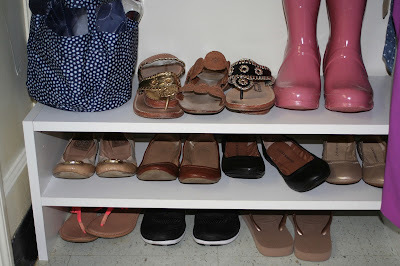 Under them I have one shoe rack which holds all my summer/fall shoes. 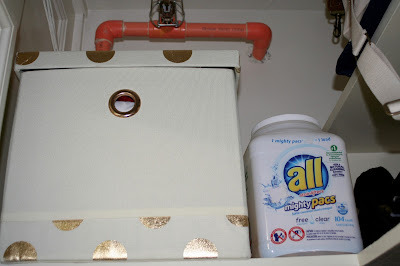 I also keep my shower caddy on there because I don't have anywhere else to put it. I got this amazing collapsible laundry basket from Bed Bath and Beyond and that goes next to my shoe rack. As for the shelving above, I have a whole bunch of winter sweaters and vests in that gold fabric box. 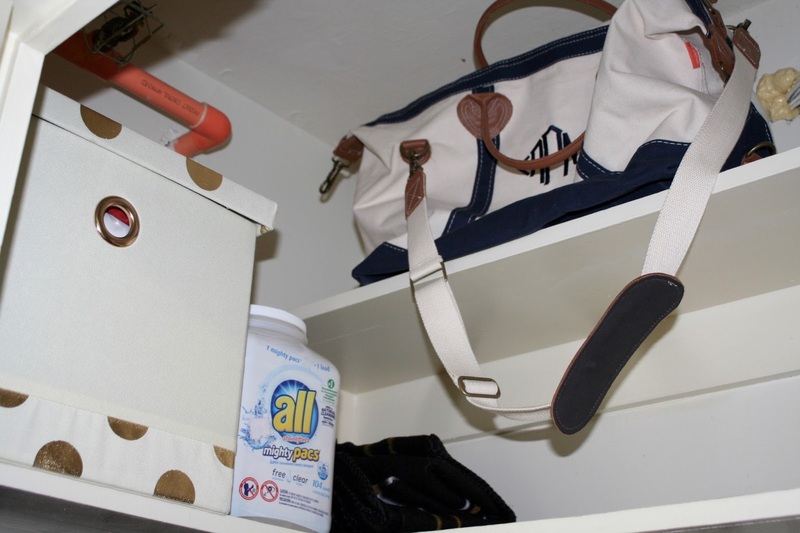 I also keep an extra blanket, laundry pods, and my travel bag up there! 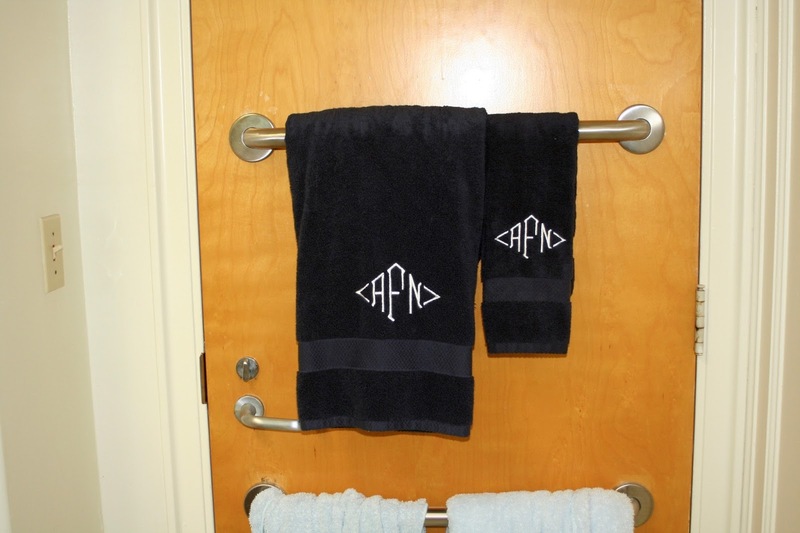 We have a towel bar on the back of our door. I got these towels from J.C. Penny and had them monogrammed locally. 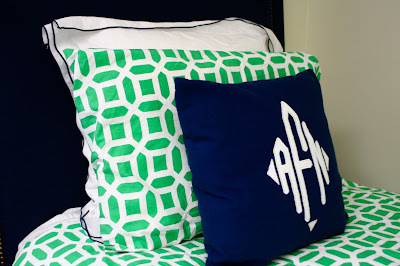 They are so cute and the monogram matches the pillow on my bed. I absolutely love my desk. I actually really like doing homework there and it is perfect for finishing up last minute things at night so I don't have to walk back from the library at night. I also use it to get ready in the morning. The biggest thing I have on my desk is my lamp, it is from Target and is so nice because it is really adjustable. 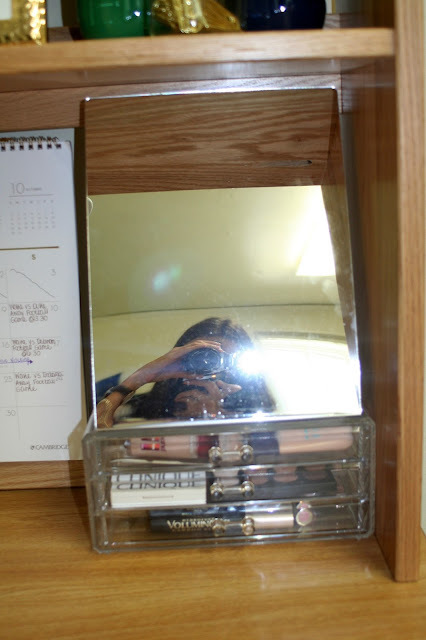 I also have an acrylic box with my makeup and a mirror. My makeup brushes are in the cutest stripe jar from Hobby Lobby. The calendar is also from Target and is great for remembering important upcoming dates. I also have my stapler and tape dispenser. 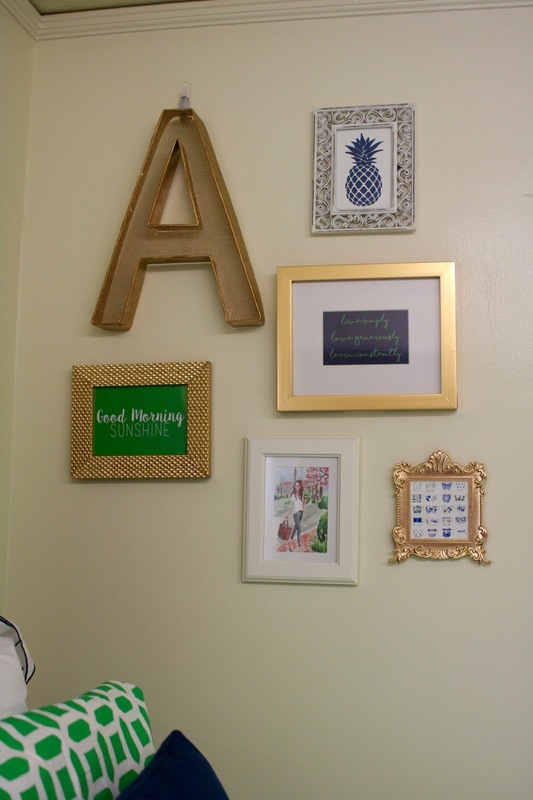 The navy picture frame is from Ikea and the gold frame is from Hobby Lobby; I love how they look paired together! 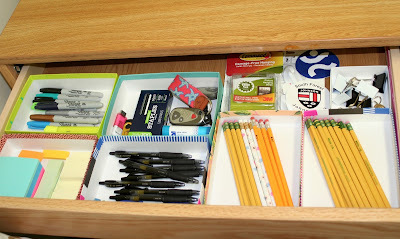 I organized my drawer with different Birch Boxes. They fit perfectly and look so cute! 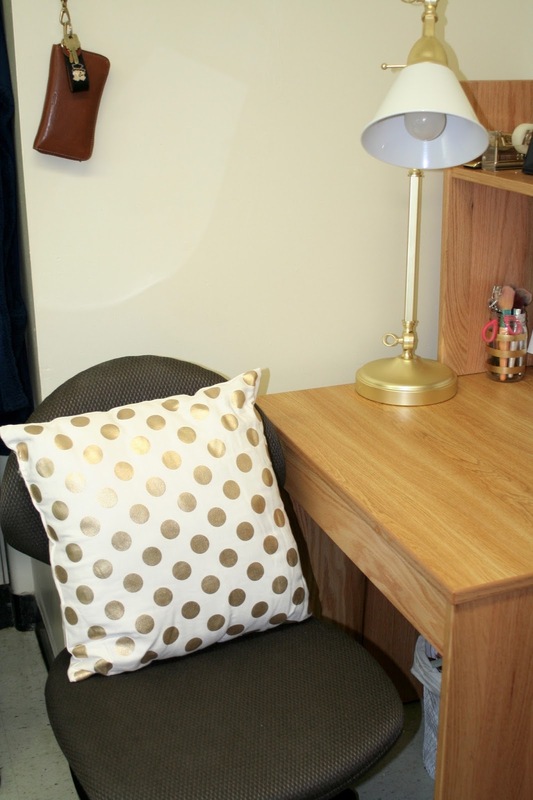 The room came with the desk chairs, but the pillow is from Hobby Lobby. 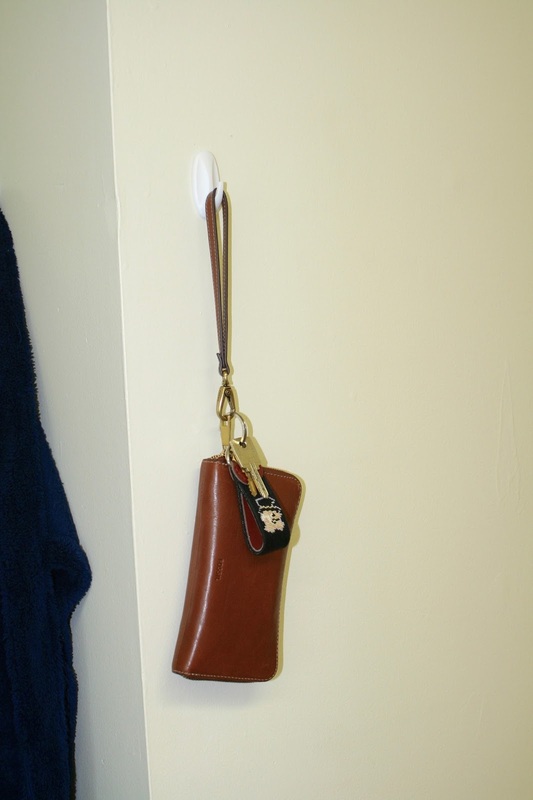 I also have a command hook where I hang my wallet and keys so I don't forget them! I also have a hook where I hang my robe. My robe is from PB Teen and is so fluffy and fun. 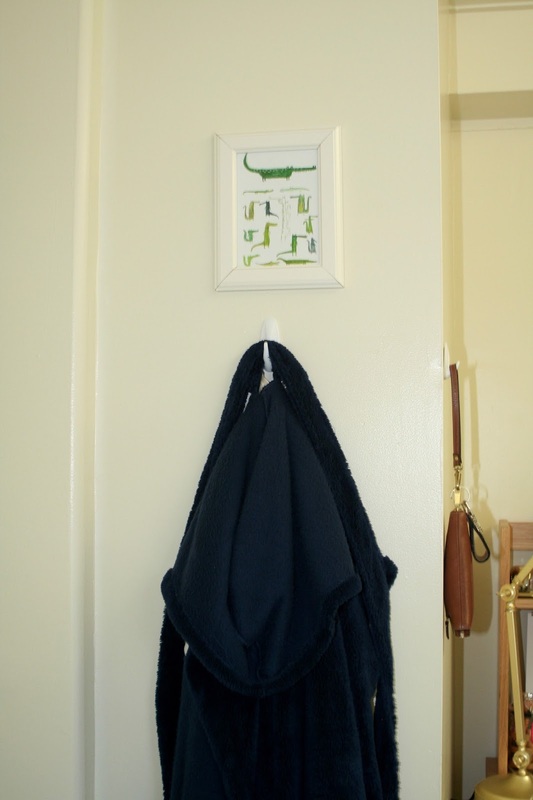 I put this adorable alligator painting above it just to add a little bit more decoration. I hope you all enjoyed seeing my dorm room! I really love my room. I am in a double, so I do have a roommate. We decided not to match our decor since we both have different styles, but it worked out ok because we both have our own space. We have been living really well together so far! I tried to link and say where everything is from, but if you have any questions at all please just leave me a comment! It's so cute!!! I love especially love your bedding! Your room is adorable! Love how you have it organized!